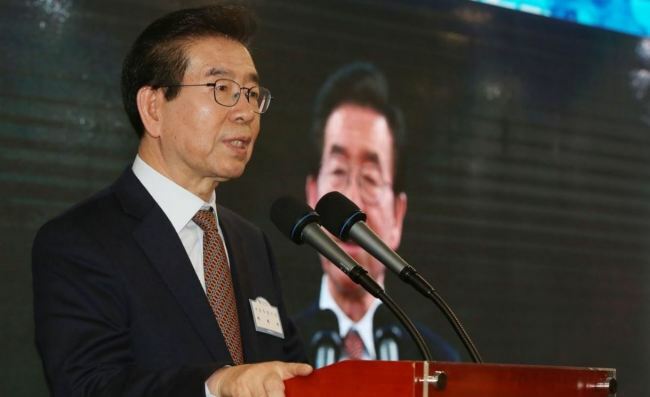 Seoul Mayor Park Won-soon on Monday rebutted the Chinese government's recent allegation that China has nothing to do with hazardous fine dust over the Korean Peninsula. Park said in a radio interview that he has research papers from municipal and state labs that conclude around 50 to 60 percent of fine dust over South Korea is from China. "The matter should be approached by environmental experts or from the scientific perspective," the mayor told an MBC Radio talk show. "Researchers at the Seoul Institute and labs affiliated with the Ministry of Environment have said China is more than 50 to 60 percent responsible (for fine dust over Korea)," the mayor stressed. Park's remarks came after a spokesperson for China's Ministry of Ecology and Environment last month denied allegations that China is the source of massive amounts of fine dust particles that regularly blow over the Korean Peninsula. The spokesperson reportedly told Chinese media that fine dust in Seoul is generated locally and China is not responsible because its own air quality has improved in recent years. The Seoul mayor, however, proposed closer bilateral cooperation and discussion between the two countries to reduce the levels of fine dust, instead of engaging in a liability dispute.